Greg Dunn, a trained neuroscientist, has spent hours examining nerve cells under the microscope. Within the complex networks of neuron branches, he discovered unexpected beauty — and a new calling. Dunn collaborated with applied physicist Brian Edwards and Carnegie Mellon University’s John Pyles on “Self Reflected,” his most ambitious work to date. The National Science Foundation (NSF) funded the project. 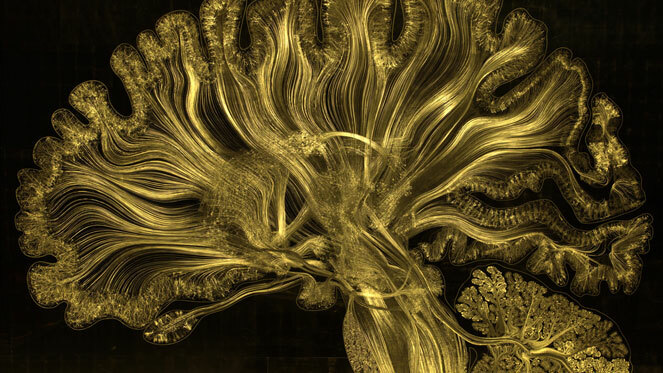 The culmination of their two-year effort is an 8’ x 12’ gilded microetching of a sagittal slice of the human brain. An interactive element mimics the brain activity of the viewer using reflective technology created by a process similar to that used to make microchips. The piece recently debuted at the Franklin Institute in Philadelphia as part of its permanent collection. “I have never been involved with something like this before. It was a unique opportunity to work on a collaborative project which is an incredible combination of cutting-edge scientific techniques and art,” said Pyles, a research scientist in the Dietrich College of Humanities and Social Sciences’ Psychology Department and Center for the Neural Basis of Cognition (CNBC). He contributed his expertise in anatomical and diffusion MRI, as well as images and white matter connectivity data from his own brain. Pyles acquired the data with a technique called diffusion spectrum imaging (DSI), a specialty of the Cognitive Axon (CoAx) Lab directed by Assistant Professor of Psychology Timothy Verstynen. Kevin Jarbo, a Ph.D. student in neuroscience, performed the tractography analysis using computer algorithms to map physical connections in the brain. Dunn has a longstanding relationship with CMU: Winners of the Andrew Carnegie Prize in Mind and Brain Sciences receive his artwork. Michael Tarr, head of the Psychology Department, commissioned a series of his neuroscience-themed paintings to display in Mellon Institute. And his work was highlighted at “Neurons and Memories,” a 2014 exhibit at CMU’s Miller Gallery curated by Patricia Maurides in the School of Art. Watch a video of “Self Reflected”.